Family members of the victims of Thursday’s tanker fire outbreak on the Lagos-Ibadan Expressway yesterday besieged government hospitals in search of loved ones. This was just as a source hinted on the possibility of mass burial for the deceased victims of the explosion, given the terrible conditions of the bodies. It was gathered that all the bodies were burnt beyond recognition while a good number were dismembered by rescue equipment. An official involved in the rescue operation, who said the bodies were taken to Mainland General Hospital, Yaba, told our correspondent yesterday that although the state government was yet to take a decision in respect of the burial arrangement, mass burial for deceased victims could not be ruled out. The official said: “I really do not know, but the possibility of mass burial cannot be ruled out. People who are complaining about not seeing their loved ones, is it completely burnt bodies they want to see? Our correspondent, who visited the Trauma Centre of the Lagos State University Teaching Hospital (LASUTH) Ikeja and the General Hospital at Gbagada, Lagos, observed a lot of people making enquiries on the whereabouts of their folks. Some of them faulted government’s claim that only nine persons died in the incident, insisting that many people, including school children, were yet to be accounted for. Although officials at the Trauma Centre and LASUTH claimed that neither dead nor injured victims were brought to the premises, it was learnt that five injured persons were transferred from the former to Gbagada General Hospital. Our correspondent gathered that while two men were moved to the emergency ward of the hospital on Thursday night, a woman named Mrs. Ade Shittu, a bus driver identified as Wasiu Olaitan and another unidentified man were transferred to the hospital yesterday morning. Mrs. Shittu, almost covered in bandages at the female ward, said the explosion occurred in less than a minute. According to her, the fire caught up with her while she was trying to run away from the scene. She said: “I am a civil servant and had closed from work. I was in a commercial bus on my way home when the incident occurred. I cannot really say what happened but we heard a loud noise and people were running. A husband to one of the victims told our correspondent that he counted 67 burnt vehicles at the scene of the incident on Thursday night, adding that he trekked from Berger to the Trauma Centre in search of his family member. He said: “It is not true that only 54 vehicles got burnt. I counted 67 vehicles. I trekked from Berger to the Trauma Centre and back. “Yesterday was a terrible day but I thank God my wife survived it. I pray for God to comfort those who lost loved ones in the unfortunate disaster. “I cannot say the number of people that died, to be honest. Most of the bodies were dismembered. Others have been burnt and turned into small objects. Those escalation equipment were carrying up charred bodies, so, how can they be counted? Olaitan’s wife, Fadiat, said her husband sustained minor burns on the arm, adding that she was yet to see him. Another relative, who declined her identity, told our correspondent that she was not allowed access to her husband. She said: “We have been in this hospital since morning that they brought them here, but the workers would not allow us in. They were brought in from the Trauma Centre. Similarly, a family took to social media to search for their three-year-old son, Eyitayo, yet to be found after the inferno. According to the poster, Mrs. Funmi Balogun, Eyitayo was in the car with his twin sister, Eyitoke, their mother and driver when the incident occurred. 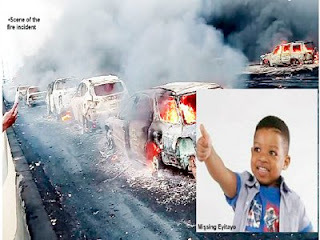 Balogun, who posted the boy’s picture on her Instagram page, fabrics_n_more, wrote: “He was involved in the unfortunate tanker accident with his mother, twin sister and the driver at Otedola Bridge yesterday (Thursday) evening. “They were a few cars away from the tanker when the explosion occurred. The driver, Mr. Joseph, carried Eyitayo while the mother escaped with Eyitayo’s twin sister, Eyitoke. Contacted on telephone, Balogun told our correspondent that she did not have enough information on it, adding that she was told the driver fell while they were running. Asked if they had gone to the Trauma Centre or the Police to register a complaint, Balogun gave our correspondent’s mobile number to her brother, Seye Famojuro, presumably the kid’s father, who said he did not want to speak to the press. A family friend of the distraught mother, who identified himself simply as Mr. Goodluck, said the three-year-old twins were returning from school with their mother when the incident occurred. Goodluck said: “I know them. They are three-year-old twins returning from school with their mother. “According to the mother, when they got to the spot where the accident occurred, they saw the fire, the mother carried the girl and the driver took the boy. “The mother said while she was running ahead, she looked back and saw the driver fall down with the boy. “She carried the girl to a safe place and came back to the spot and the fire had got there. But she believes that the driver and her son must have left the spot within the time she managed to take her daughter to a safe place and came back. “But up until now, we are still looking for them. I have checked all the hospitals in this area.